William Ireland - THE MASSACRE AT LE PARADIS - HELL IN PARADISE - MAY, 1940. Died 27th May, 1940, aged 24. Son of William John Horace and Susan Ireland; husband of Irene Victoria Florence Ireland, of West End, Southampton. Inscription reads: "Tread Softly, My Darling Sleeps Here. From his loving wife Flo and Tony." The photograph on the left shows Jim Lane pictured by the grave of William Ireland who was his cousin. The shot was taken during the pilgrimage to Le Paradis in May, 2017. ​Jim never met his cousin but can remember having a photograph of him standing on his mother's piano. William Clifford Ireland was born and baptised in Wreningham, Norfolk. He married Irene Hewitt in 1935 in Aldershot. 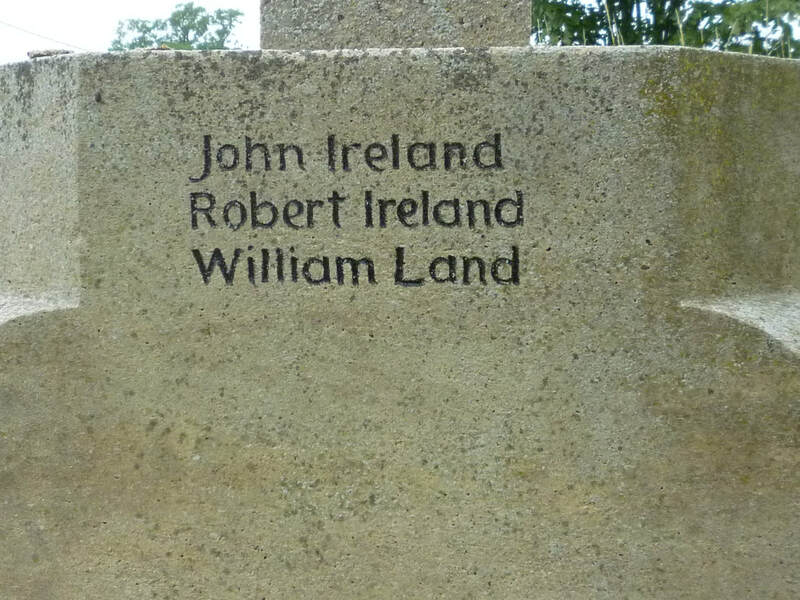 He is commemorated on the Wreningham War Memorial. His parents William John and Susan lived on the Marsh, Wreningham in 1939. Records show that there was a solitary mortar team which included Sgt. Maj. Ireland and Privates Brough and Cockerel endeavouring to support the defence of Le Cornet Malo. They were finally eliminated. Both Arthur Brough and Johnny Cockerel received leg wounds and were taken prisoners shortly afterwards. Was PSM Ireland killed just outside Le Cornet Malo or, if wounded, did he find his way back to Le Paradis only to be massacred? Having found his way back to Le Paradis was he the PSM who led the first surrender party as described in the book The Vengeance of Private Pooley or was it Jack Whitlam or somebody else? The book says that a white towel is found ‘ A Platoon Sergeant Major fastened it to his rifle and then moved to the back door of the cowshed, opposite the one they had entered……………..the Sergeant thrust the rifle and towel through the slightly opened upper half of the door and held it thus for two or three minutes. The firing stopped. “Open the door,” commanded the C.O. “Follow me,” said the Platoon Sergeant- Major holding the fluttering flag. Then he went out, five or six men at his heels. He had not gone ten paces before a machine-gun opened fire on them and the Platoon Sergeant-Major and three or four men fell shouting and groaning … the rest of the men rushed back." His headstone shows he was killed on 27th May 1940 which suggests his death may have been accurately witnessed unlike the ones in the massacre (which includes the first surrender attempt). Jim Lane believes he was killed in the first surrender party….but where is the proof? If he was exhumed then he was in the massacre not with the first surrender party. If he was in the first surrender party there would have been no one other than O’Callaghan and Pooley to witness his death on 27th. They can only refer to a PSM.